TMS products could be categorized by "application user-oriented" or "application developer-oriented". Products like TMS Aurelius are heavily developer-oriented: it's the developer that "uses" the product during most of development time and the application user have no idea it even exists. Products like TAdvStringGrid stays in the middle: programming effort might be required to achieve the desired behavior of the grid, but at the same time the application user benefits from grid features, viewing data, interacting with the grid, etc..
TMS Workflow is in the "user-oriented" extreme: it's the application user, that will mostly use it. You will do the effort to do some initial setup, setup some configuration, build some initial integration, and that's it: now it's up to your user to benefit and live with TMS Workflow for the rest of your application life. This post shows the new features introduced in most recent release of TMS Workflow, version 2.1. And you will see how it's heavily user-oriented and focused to make the life of application user - your customer! - easier. When building the workflow definition, there are many parameters that can use expressions and thus workflow or system variables. With this new helper tool, users can see all the existing variables that can be used in expressions, and can drag a variable name and drop in a control that accepts expressions to create an expression with the variable name. It's even useful to know which parameters can accept expressions. TMS Workflow provides the Script Block to allow users to execute scripts when the workflow reaches a specified point in the diagram flowchart. But it's often not very productive to create the block, connect lines, etc.. And it also pollutes the workflow diagram with irrelevant information (most managers and workflow developers don't want to a script block in the middle of the process indicating that some low level stuff is being done). To improve that TMS Workflow 2.1 introduces transition scripts: each transition can have a script associated to it. If the execution flow goes through a specified transition, the script associated with it (if any) is executed. Much easier to setup and makes your workflow diagram display only the relevant parts of the business process. 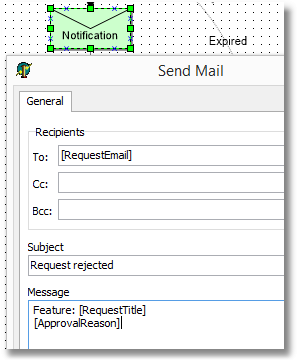 A block to send an e-mail notification. In addition to the automatic e-mail notification about tasks, if the user one to send a custom e-mail to someone, this is a very straightforward way to do it. Executes an SQL statement in the database. Users don't need to create datasets or wait for you to build custom functions. If they just want to update some status in database or set some field value, that's an easy way to do so. When creating tasks, users need to specify the list of valid status for the task. In many cases, the status are the same: "open/closed", or "pending/approved/rejected". 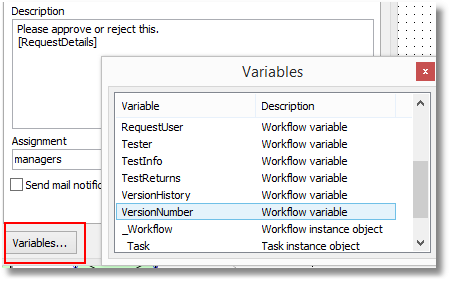 Although TMS Workflow already has the Approval Task Block that automatically creates "approved/rejected" status, your user might have other needs for a different list of status, and still use it to create several different tasks. With status templates, you can predefine a list of status under a specified name, and your user can just choose from those predefined templates to quickly create the list of status in a task. Visual blocks to display information in the workflow diagram. The nice thing about text blocks is that they are dynamic, so your user can build a definition that shows a date, a task status, or other relevant information that changes as the workflow is being executed and tasks are being completed. Wagner, this is cool if you support a DB mapping tool to let system use a Many 2 Many relational Db implementation for storage. I did this in a similar tools which was useful specially when trying to load in non Application codes. any updates about fm edition? no plan to use it in intraweb??? When there is sufficient demand, this can be considered.